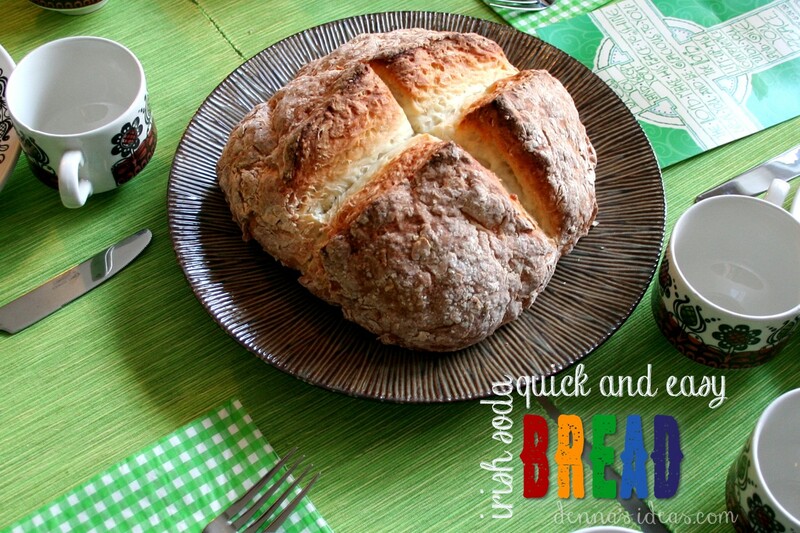 I made this recipe for Irish soda bread for our St. Patrick’s Day meal, fitting, eh? I found the recipe in my rusty trusty Fannie Farmer Baking Book (the one I was going to throw out when somehow it made it’s way into my house, but then I decided to use it to press flowers in, then finally when I actually started cooking and baking, realized that it contained some great recipes and instructions! Now it’s my go-to for baking. Funny how things work out….) 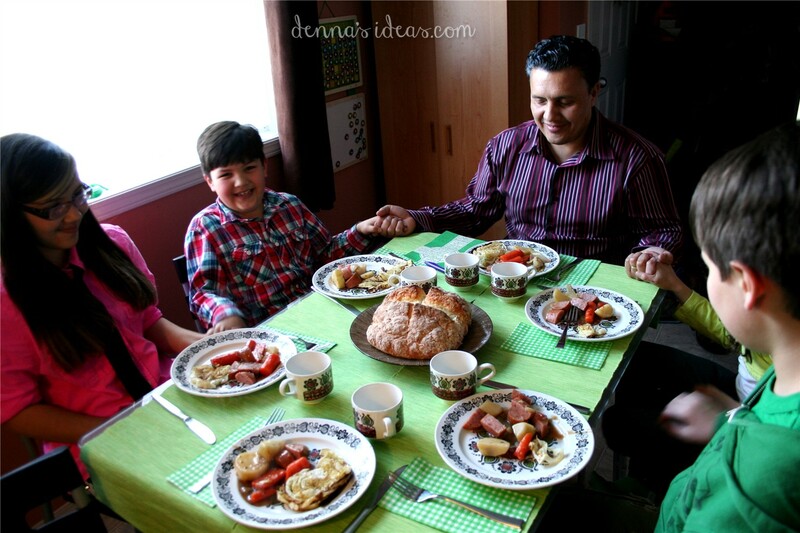 Here are the photos, then I’ll add the recipe. It’s such a gorgeously rustic looking bread! I love the texture, color and the big cross in the center. Oh, and the smell while it bakes, and did I mention that it was easy? And only takes 4 ingredients! F.O.U.R. Having said that, I didn’t actually have all of the ingredients on hand…. 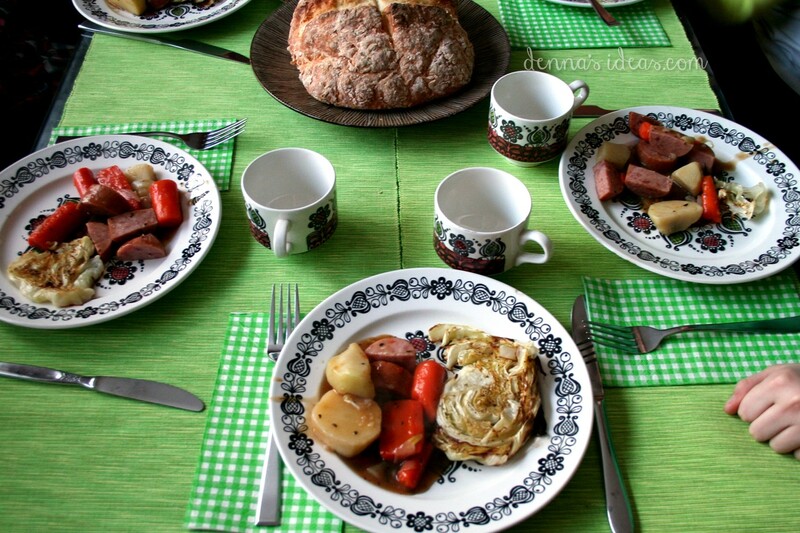 I had spent my time working on roasted cabbage and an “Irish” stew variation (made with what I had on hand: sausage, potatoes, onions and carrots…but I guess that that’s fairly authentic anyways). 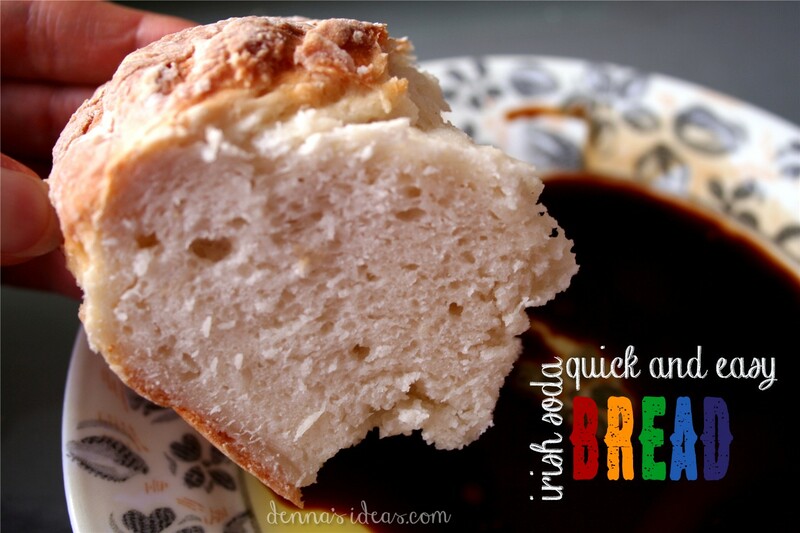 So I go to bake up some Irish soda bread, like I did last year. I measured out the dry ingredients and opened the fridge. I knew that I didn’t have buttermilk, so I would just use milk and vinegar or lime juice….but no milk!!! I dashed to the computer and typed in “substitutions for buttermilk” and found a great link here, so I found out that I could use yogurt as a substitute! Yay, I had lots of greek yogurt! Here’s a close-up of the texture (I was eating the leftover bread with balsamic vinegar and olive oil as a snack…sooooo good!) 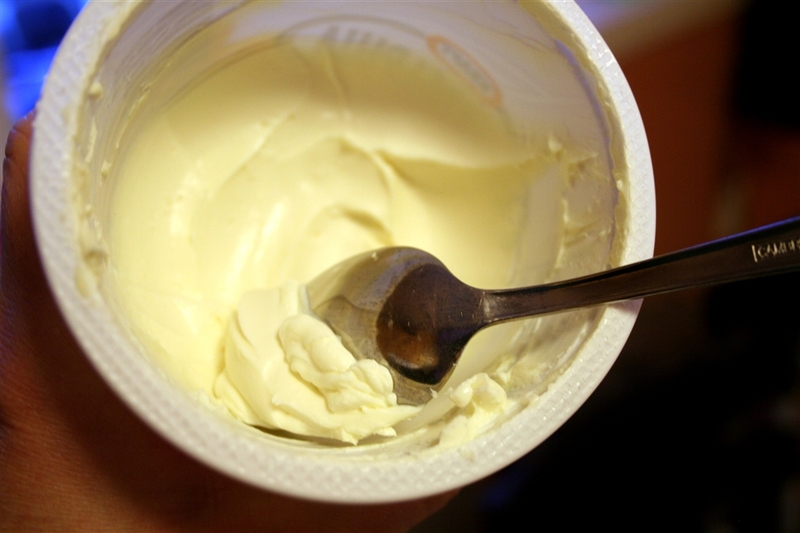 Remember, this was made with yogurt, and no extra fat! A very white color and great taste, and it must have a lot of protein with 2 cups of greek yogurt!! Now on to the recipe…. Preheat your oven to 3750 F. Grease a baking sheet or an 8-inch round pan…I used baking parchment on a cookie sheet. Add all the dry ingredients into a large bowl (flour, salt, baking soda) and mix them around. Add buttermilk and stir it up with a fork until it holds together in a rough mass. Since I was using thick yogurt, I actually had to add just a bit of water to the dough to make it mixable. Knead the dough a few times (I did this right in the bowl) then pat into about an 8 inch round mound on the sheet (or in the round pan). Using a sharp knife, slash a large X into the top of the dough, about 1/4 of an inch deep. Bake for about 45 to 50 minutes, until it is nicely browned and the X has spread open. Transfer to a rack to cool for awhile, then wrap it in a slightly damp tea towel and let it rest, on the rack for about 8 hours. This recipe makes one round loaf, and it should be completely cool when you serve it. The rest time in a damp towel helps the crust to nicely soften up. We didn’t wait 8 hours, obviously, or it wouldn’t be such a quick bread!! If you can whip this up right before you prepare the meal, bake it, then let it sit in the damp towel while you make the rest of the meal, it should be ready to be served when the meal is ready. Using the towel is a good way to store leftovers. This bread also makes great toast! I love it with balsamic vinegar and olive oil, or just plain with butter. This loaf was enough to go with 2 meals for the six of us! So thankful for our blessings! We’ve come to love this casserole-type recipe (I don’t call things “casseroles” around my house, but I will here!) for several reasons: it’s quite fast and easy, it smells heavenly when it’s baking in the oven, it makes great leftovers and it actually tastes super!! 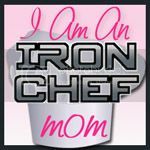 I found the recipe on Allrecipes.com and when I read the ingredients I thought, what’s the big whoop? these are all the same things I use all the time, in taco salad and other stuff. But I decided to try it anyways, and I was very pleasantly surprised. I’ve made it over and over since finding it a few weeks ago! The original recipe is here, but I’ve changed it a bit. It’s really one of those dishes that you can throw together with what you have on hand and it seems to turn out great (not one of those measure-carefully recipes). Preheat the oven to 350 F. Prepare a 9×13 pan or glass casserole dish by giving it a quick spray with cooking spray (I’m not totally sure this is necessary but haven’t tried it without). Line the dish with one layer of corn tortillas, about 3 large ones. In these photos I was using those large tortillas that are a blend of corn and wheat flour, but I like the straight corn tortillas best, though it will take a few more of those smaller ones to cover the bottom. 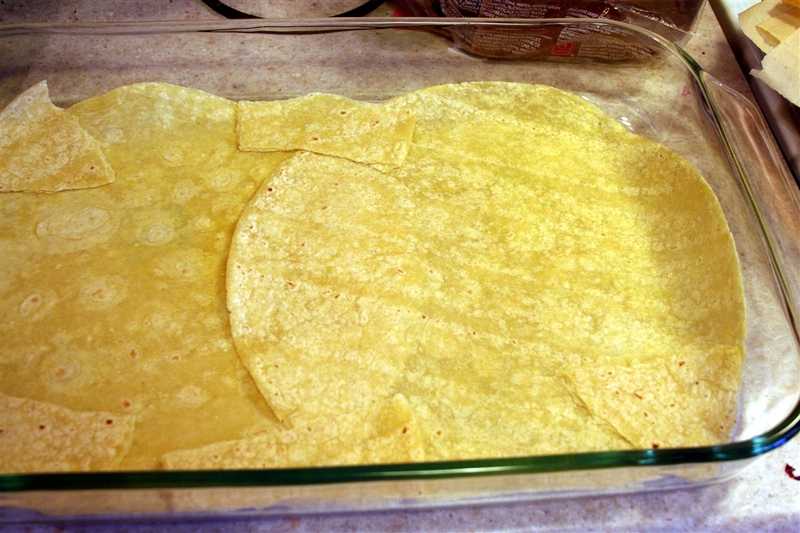 Another variation is to crunch up tortilla chips and make that the bottom layer (haven’t tried that yet). This recipe only needs one layer of each ingredient. Next, prepare the meat. When we buy ground beef, I brown it all up and make most of it into taco-seasoned meat, then freeze in meal-sized portions. So I use already browned and taco seasoned meat for this recipe. But you can brown up about one pound to 2 pounds of beef, and add some seasoned or plain salt (if you don’t want to add taco seasoning, though I’d recommend it). Then add some salsa, from one cup to 2 cups. 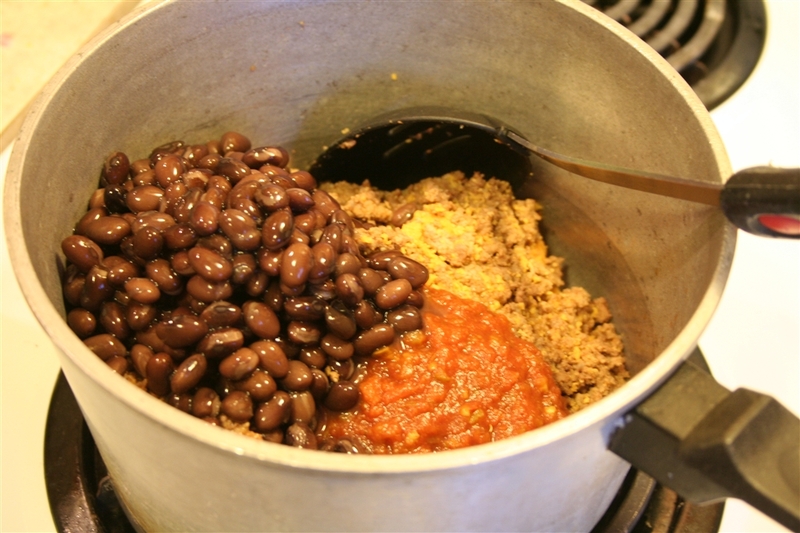 Add in the beans…try red kidney beans, it tastes great!! 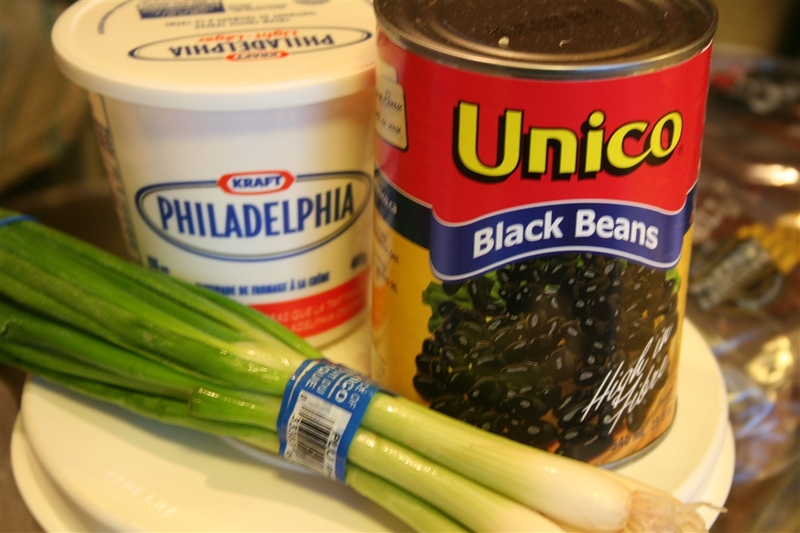 I use the whole black beans if I don’t have the kidney ones, as I did in these photos. If you have already-prepared meat, then you can just mix everything in a bowl and microwave it for a bit to warm it up. Or you can mix everything in a pot and warm it on the stove. 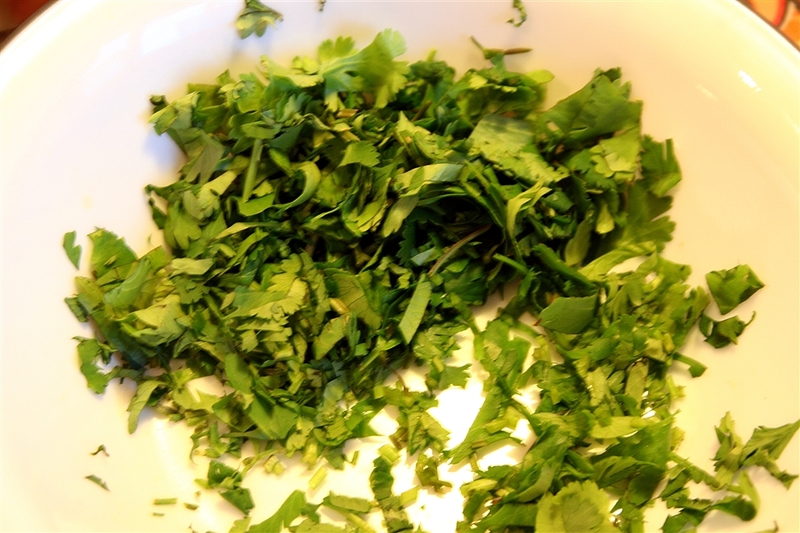 Chop up some green onions and cilantro, if you like cilantro!! And black olives, if you like them (my kids don’t, maybe someday). And a tomato or two if you want (I haven’t tried it with fresh tomatos, I just skip that). Whatever you do, don’t skip the green onions!!! 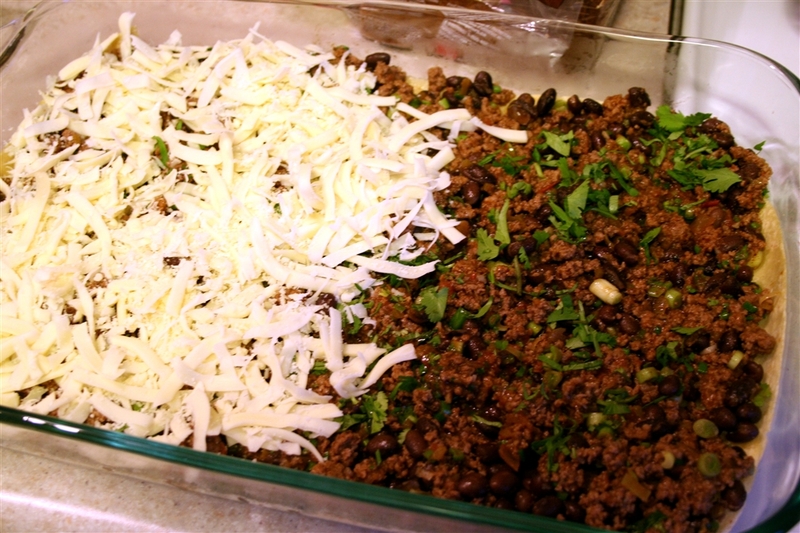 Stir these ingredients into the meat mixture, and start spreading it onto the tortillas. The meat layer doesn’t have to be really thick… (If you want you could now add a layer of sour cream, but I also haven’t tried that). 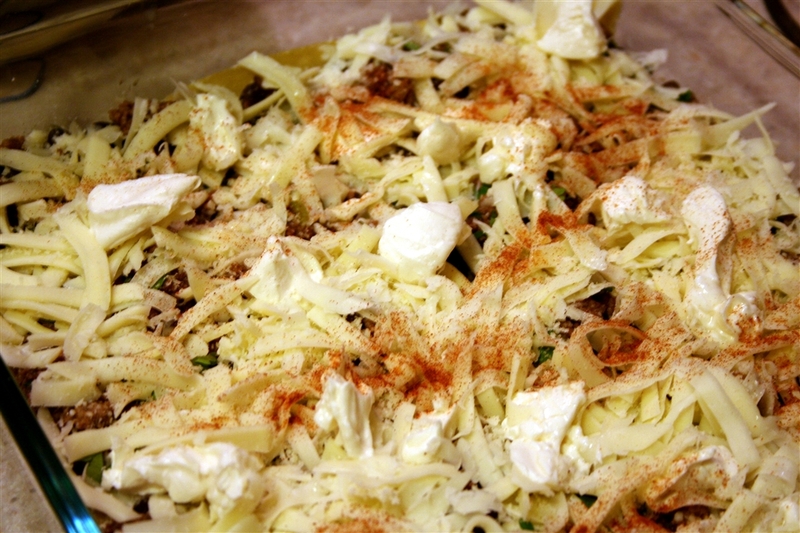 Then add a layer of grated cheese. We always use mozzarella. I think cheddar might be too rich, but use what you like best! (In these photos I sprinkled the cilantro onto the meat instead of mixing it in). When the cheese is covering the meat, add some dots of cream cheese….I just use the spreadable stuff, and scoop it out with the back of a teaspoon and plop it on in random dots across the casserole. This is the ingredient that really makes the Mexican lasagna sing, in my opinion!!! (don’t skip it!) Then sprinkle the top with some paprika. 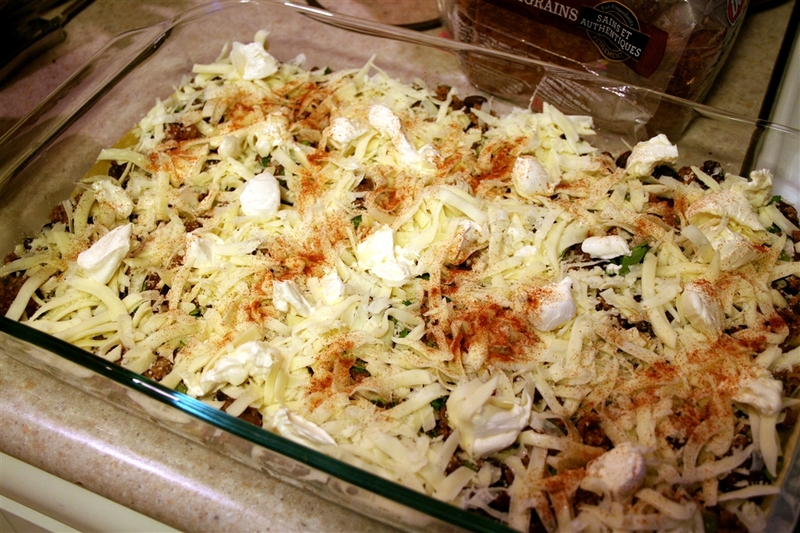 I skipped a step when I was baking this batch….I forgot to top it with some ripped up tortilla bits! 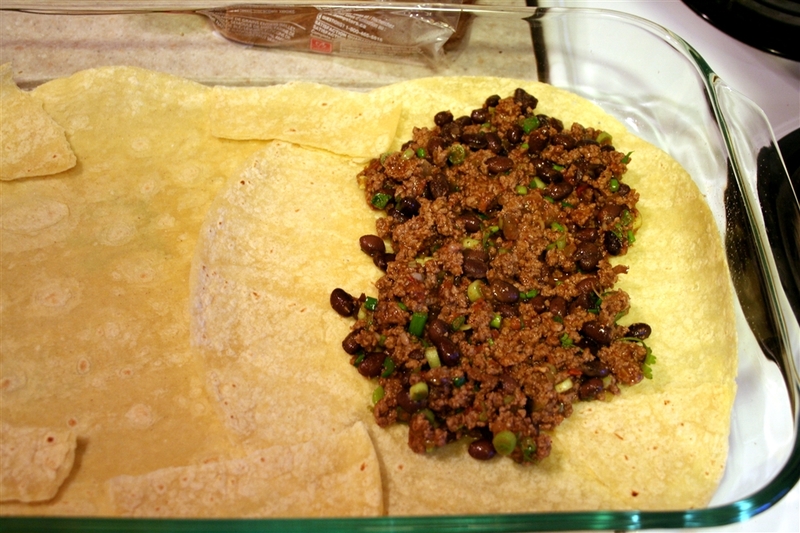 If you are using the large tortillas, it only takes one or 2 small ones, ripped up into bits and sprinkled over the top. These bits bake up crunchy and really add to the casserole. You could also use tortillas chips. As you can see, I forgot to add them this time, but it still was great! Bake at 350 for 30 minutes. Hmm, I think I left this one in for 3 minutes too long, heh heh! And there you go!! Ready to slice and eat! 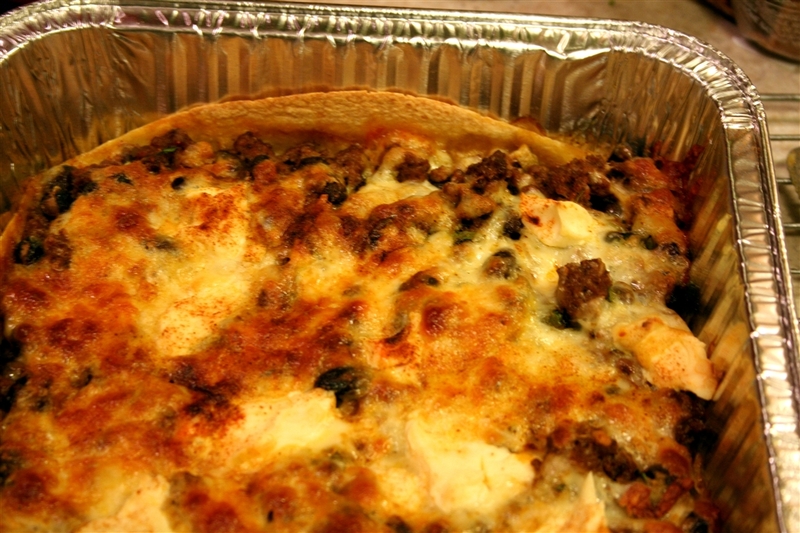 This time I made a 9×13 casserole and an extra 8×8 one to share with some friends to see what they thought…(it only took one tortilla to line the 8×8 pan)… I was pleased with their response! 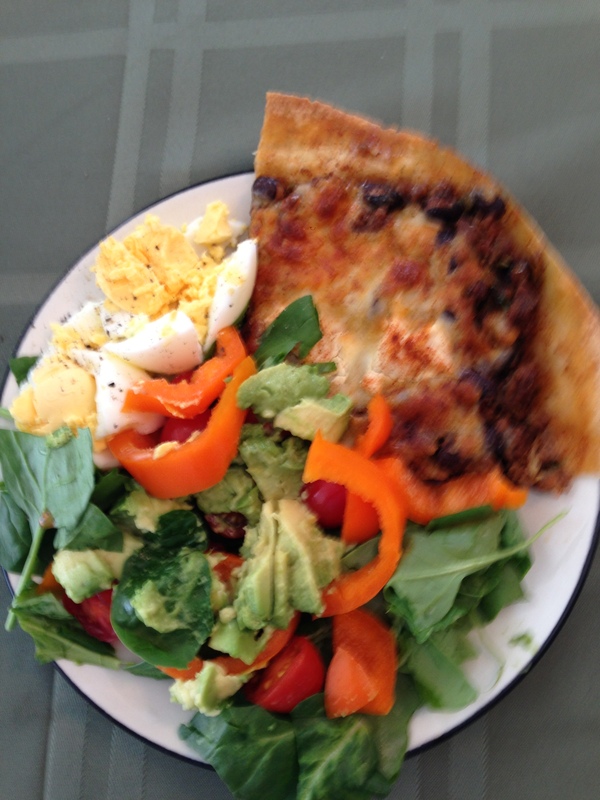 🙂 I didn’t have a photo of this dish served up on a plate with salad….I’m afraid most of my photos are taken in the kitchen with little or no natural light and many times my photos are too blurry to post….but Carrie just sent me one that she took on her phone of her serving…. 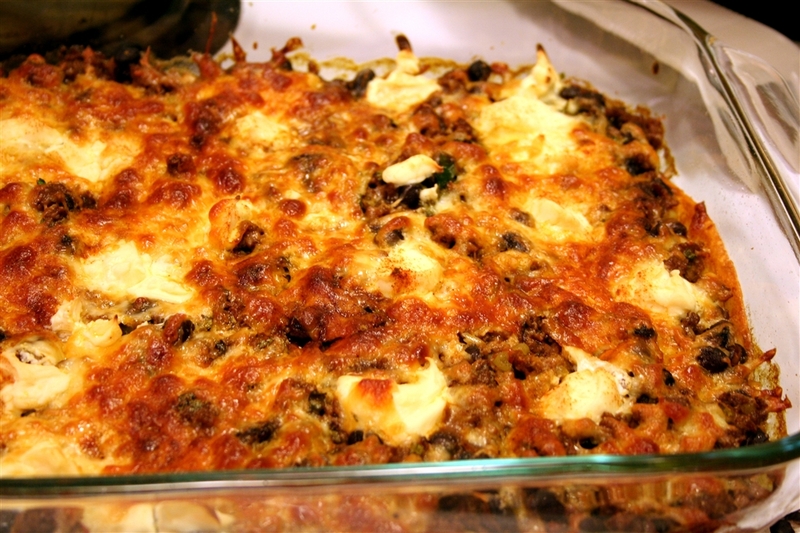 (I think she added the large salad because she wan’t sure if she’d like the Mexican lasagna, but I guess she did, since she asked for the recipe!!) So thank you Carrie! A Spring Birdhouse out of gingerbread! A Gingerbread House for Spring!